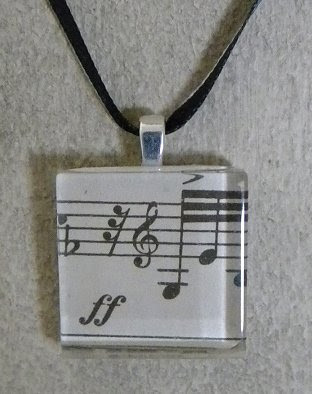 This is the first pendant up, I love the look of a simple piece of music on a black ribbon, gives it vintage charm. 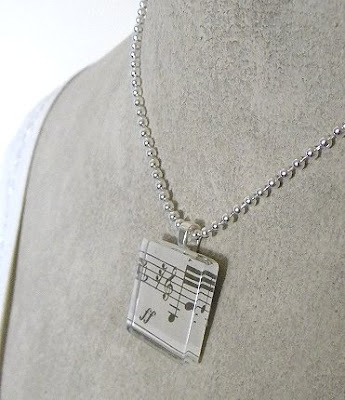 Each pendant will be one of a kind as they are made from genuine vintage sheet music - no copies. But I'm also listing it with a silver chain in case some people like to change it up a bit. 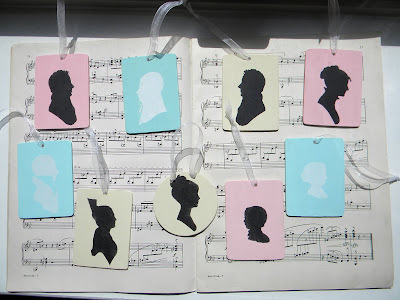 And for Easter I made a set of 9 ornaments with silhouettes in pastel colors. I love how they look all together so instead of selling them individually or in small sets I put them all together. They are all hung with the same white gossamer ribbon. 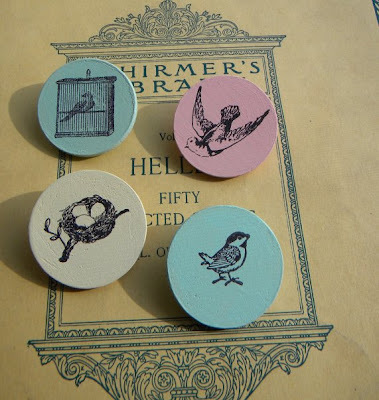 The great thing about these is you can use them as ornaments for a branch tree on your Easter table or you can use them as tags for your Easter baskets and gifts or use as placeholders on the table, make them doorknob hangers, etc. 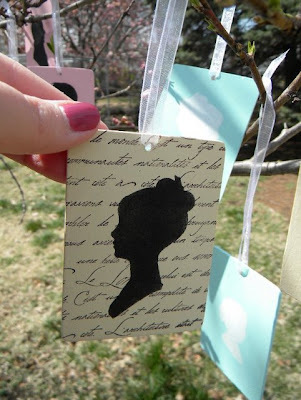 And you can write your friends and family names on them or maybe name them characters from Jane Austen novels like Mr. Darcy, Captain Wentworth, Marianne, Emma, Elizabeth, etc. 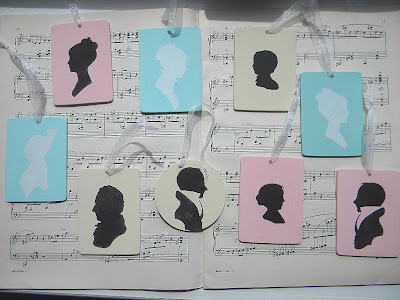 Some of the prettier silhouettes repeat in different colors, but overall you get quite a variety, each ornament has two different silhouettes, one on each side, they provide some versatility in displaying them. I took some pictures outside after the snow melted and the sun was shining...unfortunately the wind was blowing pretty bad so it was impossible to get great pictures. Just an idea of how pretty they look in the sunshine on a branch of my peach tree with the blossoms just budding. I didn't have room to spread them out and get a good picture of them all together so it looks a bit messy. Also the wind was driving me crazy. And here below is a Bonus silhouette with purchase - meaning you get 10 ornaments at a great price - less than my ornaments usually go for and even less than the others are on sale for right now! They are a bargain. Happy Spring and soon to be Happy Easter! I've got a great deal many more items on the way. As I posted earlier this month I won't be making many more silhouette items for awhile. This is the last of the ornaments I'm making for now and the framed and wood mounted ones in my shop are going to be the last for awhile. 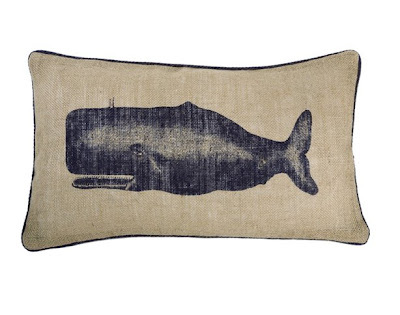 There's a sale going on now at my store and I'm moving on to other creative pursuits. More updates on the way, I'll probably be adding just about every day. I had a great weekend despite a terrible spring snow storm. 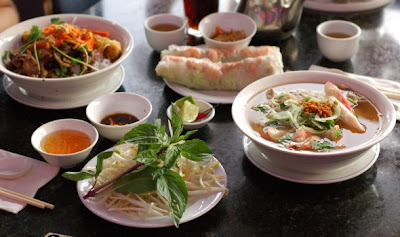 We got 5+ inches of snow and sleet, but we didn't let it stop us from going out to eat lunch at our favorite Thai restaurant on Saturday... Mmmm... Then we stopped at the used bookstore up the street. 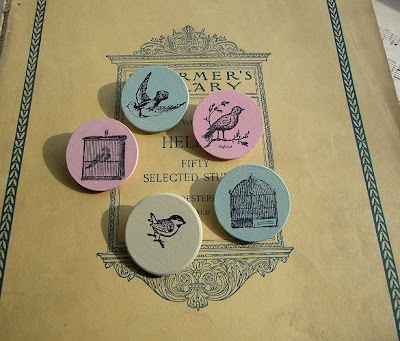 They have fabulous vintage books - some really beautiful ones to drool over. Then afterwards we stopped by the Italian store on The Hill that we've been going to for decades. We stocked up on feta cheese, kalamata olives and fresh baked bread. Also bought some phyllo dough and walnuts to make some baklava later this week. Yum! 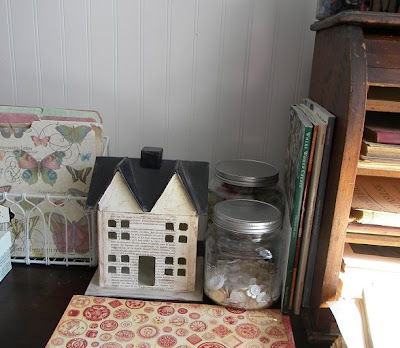 I puttered around my studio and this little vignette my father made in the corner caught my eye as it sometimes does... 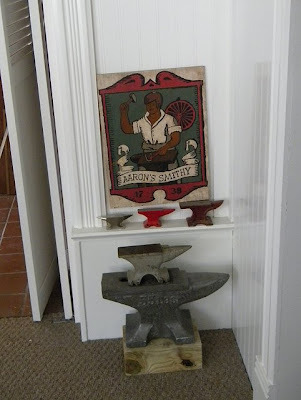 I had no idea we had so many anvils! LOL He's a carpenter and has quite a collection. I also thought this view of my desk looked sweet... A little French Literary house, vintage buttons in jars, my collection of vintage sheet music can just be seen on the right on little shelves, etc. I took a few pictures of my blooming garden last week when it was so nice - 80 degrees and sunny!! Hard to believe since it is now in the 30's and snow everywhere! 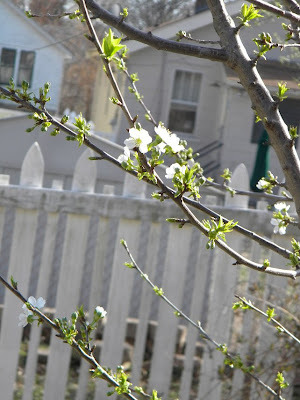 My cherry tree was blossoming and now there are tiny pink buds on my peach tree, too. I fear the hard freeze they predict tonight might mean no peaches this summer. And the mint was poking up. I'm less fearful for it - it's quite hardy and like a weed. I love adding mint to my Greek salads in the summer. Oh well, despite the snow - and more coming in a few days, I had a great weekend. Sunday we were tired and wanting to go to a movie or something, but none of the ones out seemed to appeal to all of us so we ended up getting a few dvds instead. I made popcorn (so much better homemade, anyway) and we ate licorice and had a good time at home. I've listed most of the items in my shop on sale just now. Spur of the moment Spring-Is-Here sale - take advantage of the lowest prices ever!! I've also lowered a few of the shipping rates, too. Check out whatever item you've been eyeing and see if you can get a bargain. I'm clearing some space for new items to sell. Sale ends 4/8/2011. I'm sad that Elizabeth Taylor died today, but it doesn't come as too great a surprise as she was ill a long time. 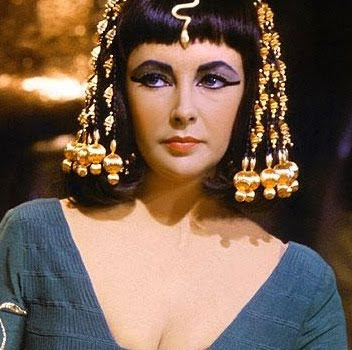 She will always be Cleopatra to me. I loved her in that film, she was beautiful and exotic, but also so queenly and so commanding in her presence on screen. There's nothing more exciting or guaranteed to cheer me up after a long cold winter than the signs of spring finally arriving. The trees are budding, there are green sprouts emerging from my garden and the weather is giving us a nice day one in awhile. I've been so inspired I've made a few items for my shop. Pins! 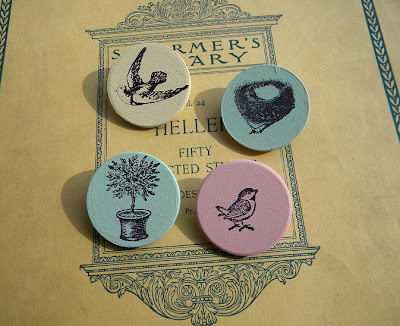 Pretty pastel colored spring-themed pins. 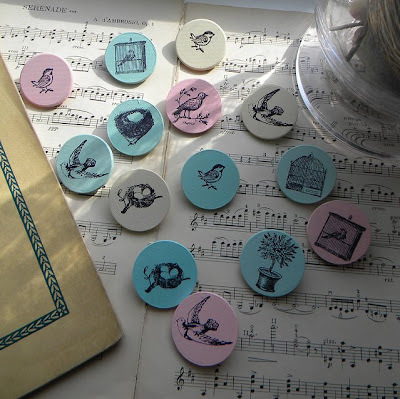 I love birds, birdcages, nests, etc. and wanted to be able to wear something thoroughly spring related. Aren't they cute? I decided to group them in three separate lots for Etsy rather than individually, but if anyone reading this would like to purchase them all in one lot for a discount price - I'm giving you, my readers, first dibs. 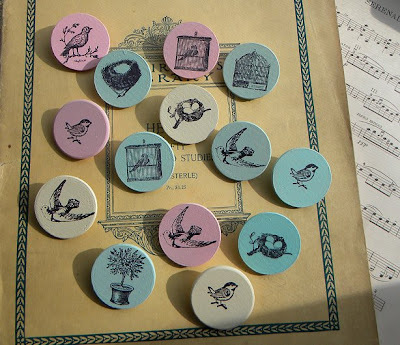 Convo me on etsy or email me at bookluv (at) gmail.com The buttons are made of wood, painted in shades of blue-green, pale pink and antique white. All are sealed with a matte finish. Group 1: Two birdcages and three different birds. Group 2: Two birds, a nest and a birdcage. 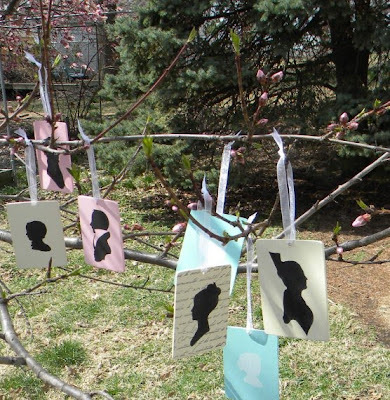 I've got one more set of silhouettes made into ornaments on the way - they need a bit of finishing, but they are very cute, Spring/Easter related ornaments. 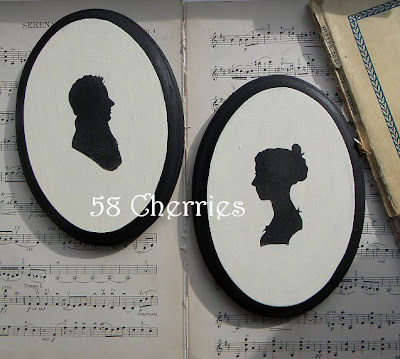 They are stenciled on antique white and painted on wood plaques. More details available when I post them on Etsy. 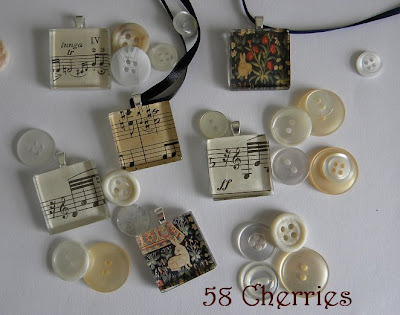 And as for the future of 58 Cherries, I've been preparing to make some new jewelry. 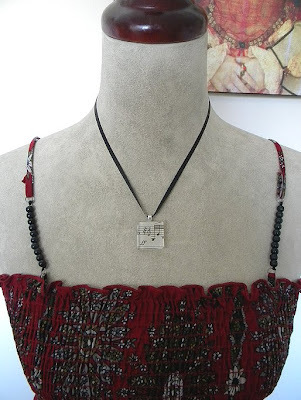 Necklaces, earrings, bracelets and more. I'm awaiting some supplies and it'll take me a bit of time to finish, but I'm very excited about what I'll be making. I hope you will like it, too. 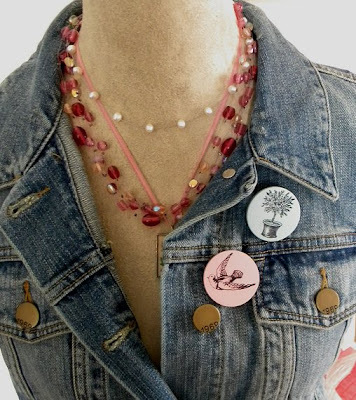 It's a combination of vintage items/upcycling, old style jewelry meets modern...well I guess I can't quite describe it without pictures to share so it'll have to wait. All I can say for now is I'm quite excited to try some new techniques and ideas. I've been somewhat obsessed with this pillow for the past few months.. 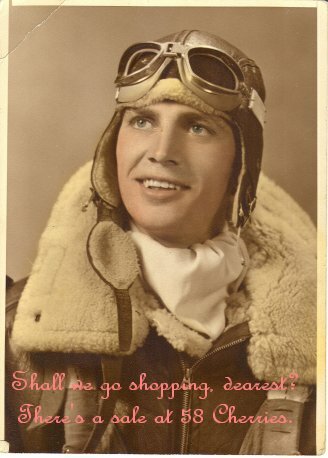 But seeing as I don't have $80 to spend on one (ouch!) 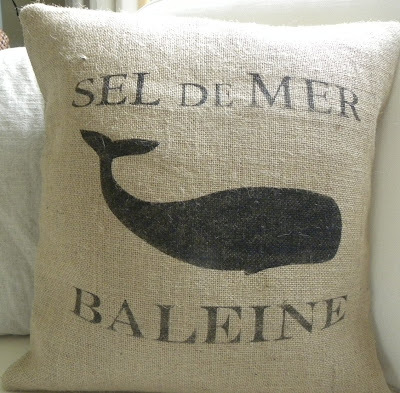 and I haven't been able to find a good clip art of a whale yet to make my own I've decided to look elsewhere. 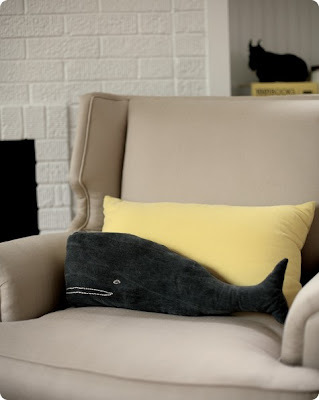 Made of denim and with the rectangular pillow behind it I think it looks like the first pillow come to life or at least 3D.